Can a title sell a book? Of all the aspects of writing craft we talk about, one that’s rarely touched on is coming up with a title. A catchy title can sell a book, but it also needs to hint at what readers will find beyond the cover. If the title is a pun, for example, we don’t expect to read a tragedy. Often, writers start out with a working title. My manuscript now entitled “Made of Shadows” originally started out as “Below-world.” It wasn’t until well into the story that I came up with “Made of Shadows.” I had to learn my world and get to know my characters more before deciding. Sometimes a catchy phrase just comes to us, and the title serves as a writing prompt. My current WIP, “Good Old-Fashioned Magic,” actually came from my morning pages, three stream-of-conscious pages prescribed by Julia Cameron in “The Artist’s Way.” In one entry I used the phrase “good old-fashioned magic.” I liked it as a title, so I opened a document and started typing. It ended up suiting the story well enough that I haven’t felt the need to change it. The title for a story can come from within the story itself. A powerful line or phrase that hints at the theme of the story could well serve as a title. If you’re stuck on a title, try selecting a few passages in your manuscript that sum up the theme of the story well. Is there a title hidden in there, waiting to be revealed? If so, does it convey the tone and genre of your story? Finish a second draft of my novella “Good Old-Fashioned Magic.” Rewrote one chapter and revised another. Two chapters to go. Read a minimum of four books on the business or craft of writing. Four of four books read. Read “How to Write Dazzling Dialogue” by James Scott Bell. What do you think? Do titles, like covers, sell books? What’s your method for titling your stories? 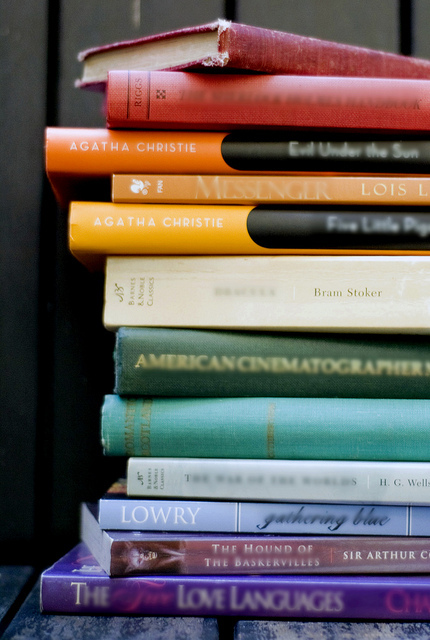 Have you ever picked up or bought a book because its title piqued your curiosity? Next postRevising a manuscript: How do you know when a draft is finished? I find titles for my short stories really difficult, but novels are easier. Usually, I have one in mind before I start writing, or one develops in the writing process. With Soulless, I had the title scheme of the trilogy set before I even had the plot figured out. And Serpent in a Cage definitely come from one of my favorite lines in the book: “‘You can’t keep a serpent in a cage for long. '” It was a good visual that matched the main plot of the book. I love the title “Good Old-Fashioned Magic.” It’s really telling, and makes me excited to read it. My latest, SHADOWBOX, started life as Project AR. This was good enough shorthand for the book while I was writing it. AR stood for Amber Room. I originally thought the Amber Room in Russia was going to be a prominent part of the story. But there is a device in the story, a sort of camera obscura made of amber, which can be used to cast shadows. A shadowbox. And the two protagonists circle each other like pugilists, overshadowed by the influence of another man. Working titles are good just so there’s something to put on the page and call your manuscript during the drafting process. I also know a few writers whose editors made them change the title of their story, so I try to come up with a really good, catchy title, but I remind myself that the final title could be completely different. I usually start with a theme. Then about halfway through the book, the real title reveals itself. Reporter: What do you call that hairstyle? For me, the hard ones are blog post titles. Blog post titles are tricky because you have to worry about search engine optimization–what would people search for that would/should bring them to your post? My most popular blog post so far has been one called “How to decorate a bookcase.” It still gets hits even though it’s a few years old, I believe because the title matches what people are typing into Google. Most of the titles in my Star Trk fan fiction/original fantasy duology series come from Shakespeare, and have particular meaning. For instance, “The Stars are Fire” is a bit from a line in the love note Hamlet wrote to Ophelia, read aloud by Polonius. My main character has a dream or a vision as a child, of dancing across the stars to a far-flung place in Everdeep, where she meets the boy who becomes her Solemate. He tells her that the stars are fire; something she’s never heard on her own world. “King of Shreds and Patches” is a phrase Hamlet uses to describe his incestuous and murdering uncle. It’s also the title of my fan fiction novel that explores the wreckage of Spock’s life during “Star Trek: The Motion Picture”, when he has failed at Kolinahr, the Vulcan discipline of eradicating emotions, and returns to Enterprise broken and silent, clearly distressed, and with a personal agenda that could get himself, his shipmates, and maybe everyone on Earth killed…that phrase seemed perfect for the deep crisis Spock’s undergoing through the novel (which is far more than the movie covers, because there’s a lot alluded to in that movie that never gets followed up on, and even more that’s never explained at all). I like the idea of using lines from Shakespeare’s work as titles. A friend of mine wrote a story in which all the chapter titles were lines from 19th century poetry. It worked really well with the tone and setting of her manuscript. I love WIPpet Wednesday, and have gotten a lot of wonderful feedback. I’ve also beta-d a few novels, and gotten a sneak peek, and made some friends. For the last few months, it’s been very helpful in letting me revise my Enterprise fan fiction a bit at a time; perfect because I’ve already got a major revision project underway. And I get to offer feedback to other writers, which feels good, and also helps me see my own work with a new perspective. Your friend’s project sounds fascinating! I have a number of idea generation documents to help me churn out ideas on a regular basis (as if I had a problem with that!). One of the documents is a title document. Whenever I hear a turn of phrase that sounds good, I add it to that list. The list is probably three or four pages long and three columns. I don’t know for sure. I’ve never printed it. But if I ever need an idea for a title, I can open up that document and scan the possibilities. For the most part, though, the working titles are pretty simple. My working titles are usually the name of the lead character. That’s how they begin life and that’s what they remain until the right title comes along. Excellent post. Great comments, too. Well done. I like the idea of keeping a list of phrases and pulling story titles from that. I bet they could also serve as great writing prompts. For me, the title is sometimes the catalyst for the story, as it was for my current WIP. Titles are tricky for me. Usually, what happens is a word or phrase pops out and I realize it fits the story to a T, so it ends up being the title. I have yet to sit and brainstorm title ideas. It doesn’t work too well for me. If you have a method that works for you, that’s what counts. Selecting a phrase from the story is a great way to go. It ties the title into the text really well–and I think readers like it when they find the title somewhere in the pages of the story. I think it’s good to google the title you come up with, too, and make sure that there aren’t already 5 books out with similar or the same names. I can’t be too clever or obtuse with titles since I’ve been publishing non-fiction lately, but when I finally get my memoir and/or novel up, I will lean more towards clever. That’s a good point. I usually go on Amazon and search for the title to make sure it’s not taken. If that search turns up nothing close to my title, I run with it. Yes, titling nonfiction is definitely different than titling fiction–with fiction you can be a little more clever, have some fun with words. Nonfiction titles can be clever but they also have to be direct. Sorry I missed last night’s #StoryDam chat. I had some errands to run and got home later than I expected. Hope to be there next week, though!